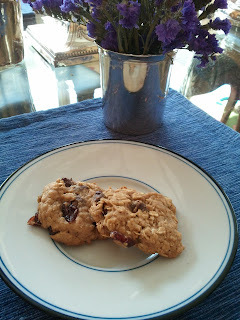 These Oatmeal Cranberry Chocolate Chip Cookies are ones I used in designing my hiking menus. They are very tasty and were a big hit with the family. They are a hardy cookie filled with tastes and texture. How can you beat a cookie with oatmeal, cranberrys AND chocolate chips in them?! These cookies have brown sugar and honey in them--no refined sugar. I even took it a step further and substituted agave nectar for the honey. They were satisfying to eat and didn't trigger my need to eat more, as cookies with refined sugar seem to do. Since they are a hardy cookie, they travel well in a back pack for hikes. These cookies are from the 400 Calorie Fix cookbook by Liz Vaccariello and can be found on page 391. Each cookie has 55 calories.